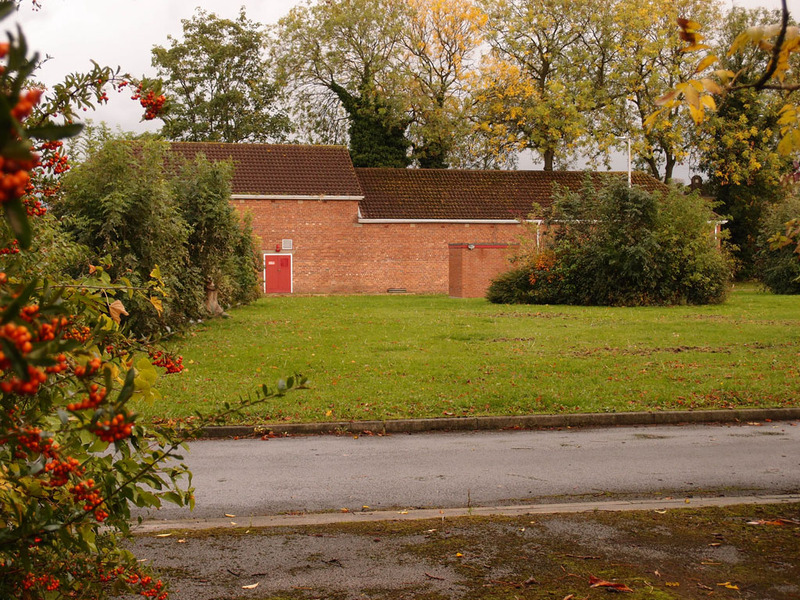 Part of the Duncombe Barracks site, on Burton Stone Lane, is surplus to requirements, and may be bought by the City of York Council, for housing. This hasn’t got much coverage, and perhaps deserves more. Recent pages haven’t moved much from Bootham/Clifton, I realise, but as this is my local patch, and as there’s been a lot to report and ponder upon recently in terms of plans and possible developments for various sites in this area, we’re again focusing on this part of town. This Google map indicates where we are on this page, and the two nearby sites written about recently. I was pleased to find fairly recent aerial views in the city archives online collection. The image above shows the barracks site towards the bottom. 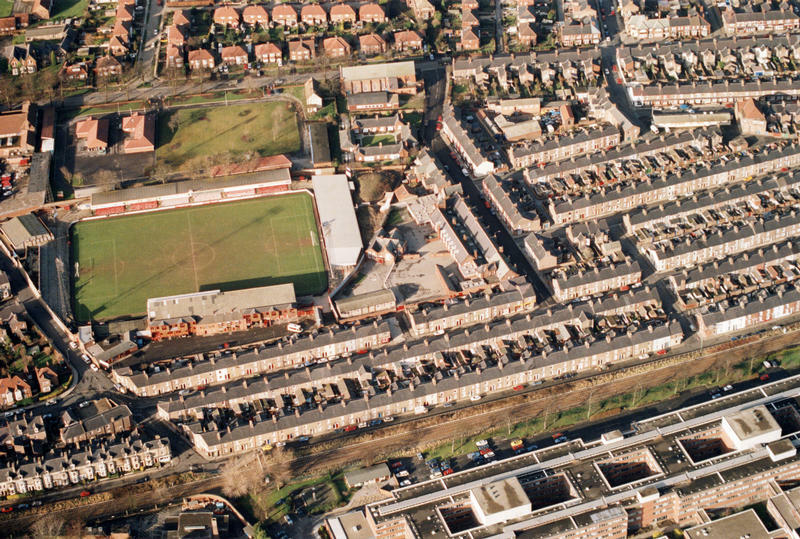 The football ground is adjacent to it, taking up most of the image. I’ve been to take some more up-to-date photos of the part of the site that’s for sale, but clearly, as it’s MoD land, you can’t just go wandering about on it for a nosy around, so I’ve taken a few photos from the boundary. A boundary which, as I’ve mentioned before, on another really old page from the past, has markers on the verge showing the ownership of this particular piece of land. This is quite a small site that’s for sale — not the whole of the remaining barracks, as I originally thought. The part that’s being sold is the area to the left of the main entrance, the area of grass and trees with an access road around it and a few buildings on the perimeter. (There’s a plan (PDF) on this link). 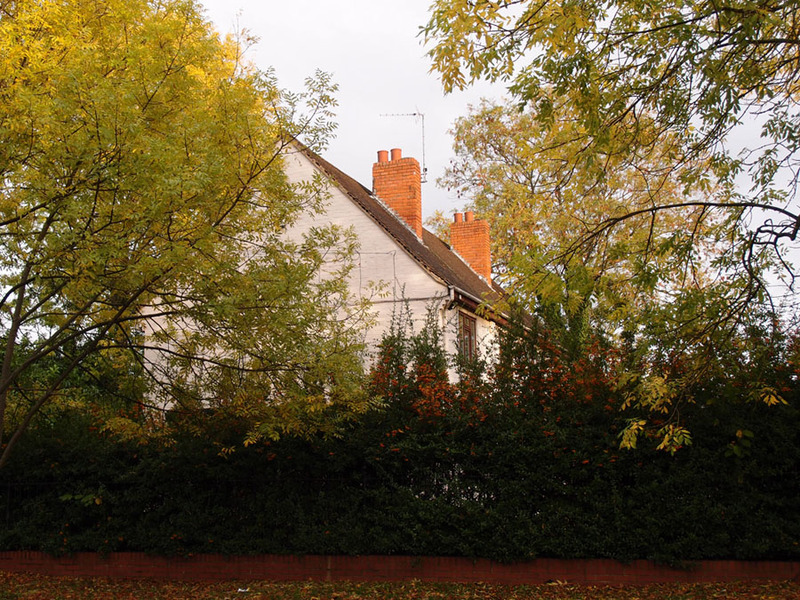 Next to one side of the site is St Luke’s church, and a small development of almshouses. On the other side is the remaining barracks area. 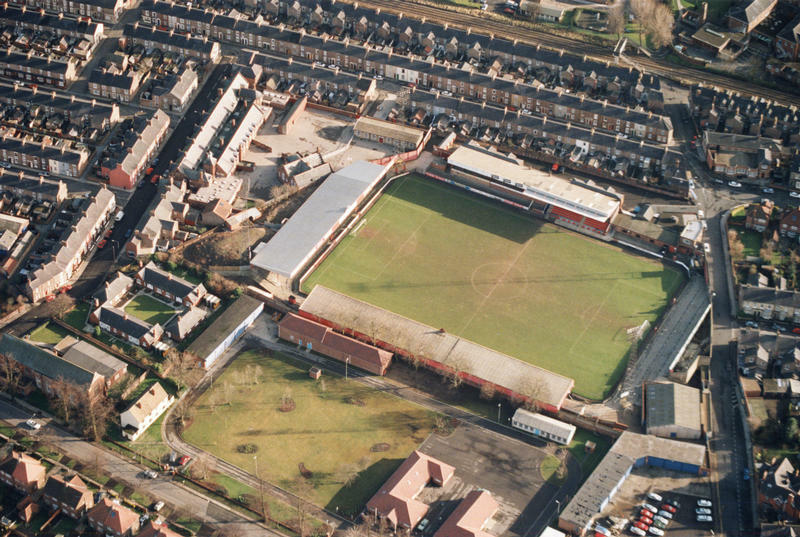 As mentioned on the earlier page about Persimmon’s Bootham Crescent plans, the city council has for a while now been investigating the possibility of buying this adjacent site. I’ve been waiting for further information on this, and now we have it, in the form of a report going to the council Executive meeting on 18 October, for a decision on whether to proceed. 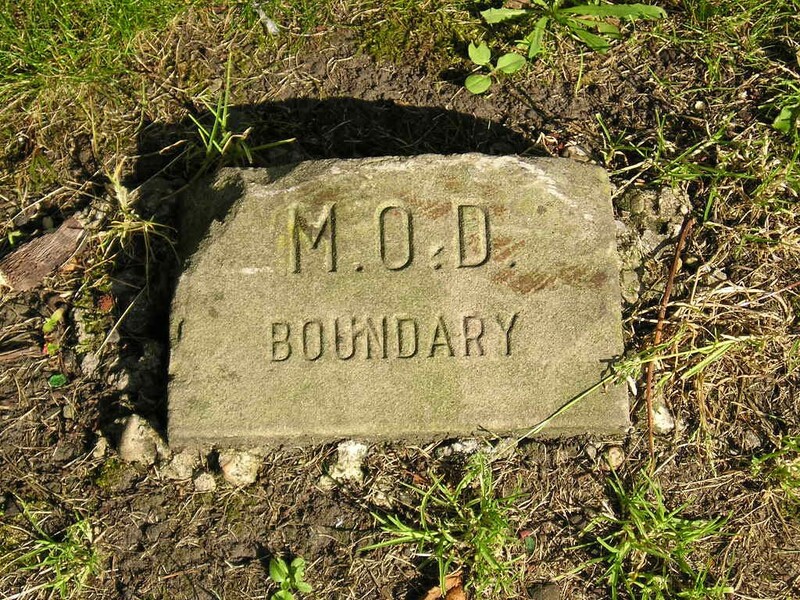 Part of the Duncombe Barracks site on Burton Stone Lane has been offered to the council for purchase from the Reserve Forces and Cadets Association (RFCA). This report sets out the opportunity a purchase of the site presents for delivering – subject to planning approval – a mixed tenure housing development including 40% affordable housing and a future income for the council from rents and sale receipts. The site includes a couple of houses already, but they’ve never looked like they were occupied. I wonder if they could be included in a housing development without being demolished. The limited supply and high cost of house prices and rents in the city is having a marked impact on the ability of York’s low to middle income households including first time buyers, young families and key workers in the health, education and care sectors to continue living in, or moving to, the city. … The Duncombe Barracks site is a time limited and rare opportunity for investment by the council to purchase land off-market and, subject to planning approval, deliver a mixed tenure housing development. … If the council decided not to purchase Duncombe Barracks the site would be offered on the open market with the likely outcome that a private developer would purchase the site. The maximum affordable housing that could be expected in that instance would be 20% under current planning policy. … It is difficult to acquire land on the open market in York, and the opportunity to develop the site for mixed tenure housing would relieve pressure on green belt housing proposals in the city and also provide much needed affordable housing at higher than planning policy levels. I’m not an expert in housing matters, but I am increasingly interested in land use, and who owns land, and I think I’d rather have the council buy the land than see it being bought by Persimmon as an extension to their existing plans for the adjacent site. I’m still not entirely clear how ‘affordable’ the ‘affordable’ housing is, here or elsewhere, but hopefully it would be more ‘affordable’ than the rest of the housing in this particular area. Whoever buys it, it looks like another site on my patch will turn from being fairly green and grassy to being covered with housing. 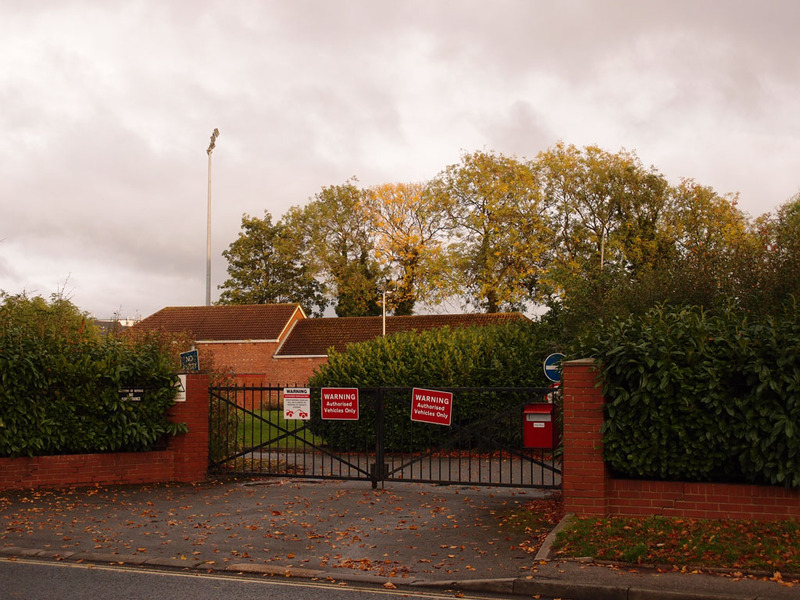 Bootham Crescent (definitely, quite soon), parts of Bootham Park (probably), the barracks site (definitely, in the longer term, whether owned by the council or someone else). This makes me feel a little bit sad, and unsettled, of course, because I’ve lived here so long, and like it how it is, and I want green and grassy places, with trees, where wildlife can wander, or fly, or nest, or feed. On the other hand, I often wonder what Clifton locals thought back in the 19th century when whole streets of terraced houses covered the fields and the long plots of garden/open land behind the houses on the streets of Bootham and Clifton, filling a huge amount of open land in a short period of time, towards the end of the 19th century. It would be hard to do this website if I was sitting in a field in Clifton rather than a house in Clifton, clearly. I get a bit exasperated when people sit in their homes built on what was green and open land complaining about green open land being built on. All things considered I recognise that we have to accept the change, and I want other people to have somewhere to live. There’s less and less land available, and so much demand, so the infilling continues. After feeling a bit sad about the loss of the green area and trees where the new housing may be built, I thought I’d go off and do a bit of research, looking at old maps. I’m glad I did that, as the old maps (from various dates in the 20th century) showed that the area of the barracks site that’s now green and grassy had buildings on it before, right across most of it by the looks of it, for several decades in the later 20th century. I just hope that any housing development will retain the trees. After seeing a large mature ash tree on the site felled to make space for a firing range I’ve asked about the possibility of a TPO on the remaining trees, but haven’t had a response. And of course any family housing built here is likely to have some garden area attached, as do the houses built on the earlier development to the other side of the barracks site. These will be supporting more of the local bird and insect populations than the concrete yard that used to be there will have done. This wider image sets the barracks site in its context, from a different perspective (with the city centre behind us, and looking out of town). 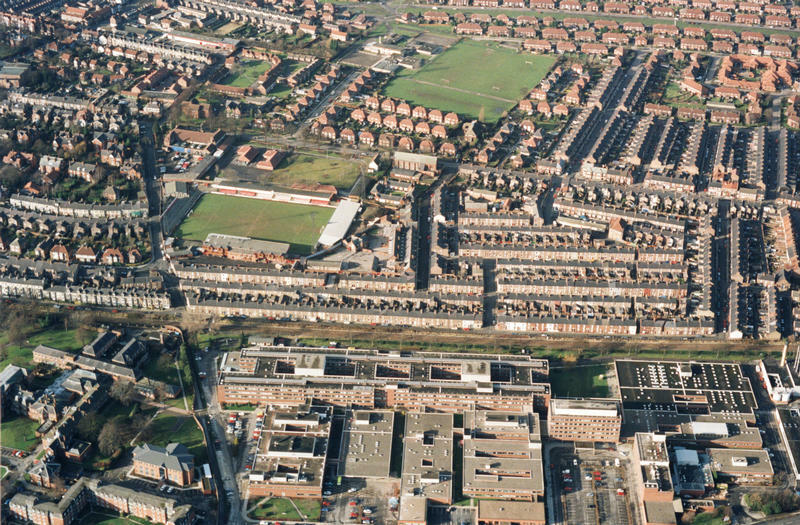 Again, this is from some years back (2000), but the green spaces pictured are still green, in 2018. The huge complex of buildings making up the city’s main hospital fills most of the bottom of the photo. To the bottom left are the buildings of Bootham Park Hospital. (The ‘gala field‘ in front of them is off to the left, not included on this photo.) The line of Bridge Lane runs between them (turning into Grosvenor Road after the railway line and its footbridge), and the railway line runs across the middle from left to right. Of course, green space doesn’t necessarily mean ‘public open space’. I hope that the football ground and barracks site developments, when they happen, will be able to keep at least a ribbon of green running through, publicly accessible, maybe also have a snicket through for pedestrians and cyclists. ‘Opportunities for connectivity between the two sites (such as pedestrian and cycle access)’ are mentioned in the report (PDF) on the possible purchase of the barracks site. But that’s some time in the future. First, the council’s Executive has to decide, at the meeting on 18 October, whether to go ahead with the purchase of the barracks land. ‘It is difficult to acquire land on the open market in York‘ is the line that stands out in all that text above. This site is where I share what I know about York, and ask questions about things I don’t know, and ponder local issues in a thoughtful, non-inflammatory, generally non-political and objective kind of way, where possible. I add to this site when I can and pay the hosting fees every month. If you’d like to express appreciation for the time and effort involved in adding to and maintaining this online record of York and its changes, and would like to help pay the hosting fees, virtual coffees are always appreciated. Thanks to everyone who supports the site in this way. By Lisa @YorkStories • 17 October 2018 Council, Planning To link to this page's proper location please use the > permalink.